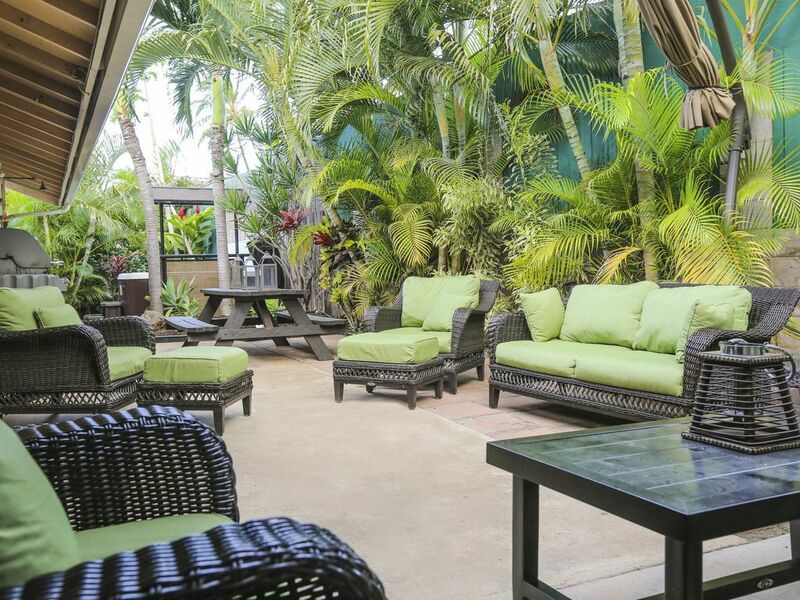 We want to welcome you to our Kihei Garden Oasis, a tropical paradise in sunny Kihei, Maui. Just pack your swim suite and leave the rest to us. Staying in a private house with relaxing outdoor spaces is truly one of the best way to share memories with family and friends. This is such a unique property that you will love it as much as we do. Check out our reviews. Our cancellation policy: when we rebook the property, we will provide a refund. See our detailed cancellation policy below. Single story private house with fully fenced yard with a 6-person secluded hot tub. - 4 Bedrooms: two king, two queen. Each room has a dresser with a mirror, TV, air-conditioner, and a ceiling fan. Our home does not have any stairs which makes it easy for small children or others that find stairs difficult. Stroll in cute little shops while trying some local shave ice. You will love Maui's most unique shopping and dining experience at Kihei Kalama Village with great places to eat and over 40 vendors and boutiques. At the south side of Kalama Beach, you will find Cove Park where you can take surfing lessons or try stand up paddle boarding. Walk beyond Cove Park and you find Charley Young beach which is part of the famous Kamaole beaches. In the morning, walk to the end of the street for coffee at Belle Surf Cafe or 5 minutes farther to the Lava Java Coffee Roasters and enjoy your coffee at the beach. During the early evening, you can relish sushi during Happy Hour at Sansei within a few minutes of the house, or enjoy the gorgeous sunsets at the beach. Tropical outdoor living area for sunning, reading a book in the shade, connecting with family and friends, grilling, or relaxing in the 6-person hot tub. We are family friendly with everything you might need including pack and play beds, bed rails for toddlers to keep children falling out of bed, high chairs, booster seats, kid’s utensils and sippy cups, strollers, children’s books, movies, games, toys, Wii and Xbox. We have games, toys and books for all ages. We have beach items: noodles, sand bucket, shovels and toys, life jackets in 3 sizes (from infant to 90lbs). Hundreds of items and too many to list. The house includes island style furniture with a full kitchen that will delight a chef. High end cookware and kitchen tools like Henckel knives, French press, coffee grinder, a comprehensive spice rack, and a Vitamix blender. Make delicious Hawaiian smoothies from our fruit trees (papaya, lime, tangerine, and passion fruit) and the farmers market at the end of our street. 5-star luxury resort mattresses (Sealy Posturepedic) with 400+ thread count pima cotton sheets and down pillows assures a good night’s sleep in a quiet neighborhood. Beach chairs, umbrellas, towels, boogie boards, beach toys, coolers, ice packs, and a variety of snorkel gear provided. Lots of extras as well. CANCELLATION POLICY: For all reservations, booking fees are retained by booking company if applicable. We highly recommend guests purchase travel insurance through the booking company or through private insurers. If guest cancels reservation, guests shall use travel insurance for reimbursement. If cancellation reason is not covered by travel insurance or guest has not purchased insurance, owner will provide a pro-rated refund based on nights that can be re-rented. Maui County approved vacation rental: Short Term Rental Permit STKM 2014/0001, Tax ID 085245542401. We are a legally permitted vacation rental. For private homes, we are required by the County of Maui to have all guests registered on the rental agreement and signatures of every adult confirming acceptance of House Policies. It is a simple process using DocuSign for electronic signatures. Dave and Jenni would like to welcome you to their Garden Oasis in Kihei. We purchased this property in 2013 because we always enjoy the aloha spirit of the islands and love to go paddle boarding, snorkeling, and scuba diving. Dave dabbles with the guitar and ukulele and loves all of the music that is so prevalent in Hawaii. Jenni spent some of her happiest years as a child living in Hawaii and we both feel connected to the island. We currently live in Seattle, and like you, plan our vacation getaways to Maui with our family and friends. We welcome you, your family and friends to our vacation paradise. Walking distance to the places we enjoy – the park with lovely beach sunsets, stand up paddle boarding, the restaurants, coffee, shops, and groceries. In addition to the two bathrooms, there is a hot water outdoor shower. Full size washer and dryer. Includes: Iron, Ironing board, Vacuum cleaner, broom, mop, dustpan and laundry soap. Free high-speed wireless internet (200mb/sec). This is extremely high speed. The house is fully loaded with towels including plenty of beach towels. Free high-speed wireless internet at 200 mb/sec download and 20 mb/sec upload. New (July 2015) full size refrigerator with water and ice dispenser. Over 30 spices and seasonings provided. A fully stocked kitchen that a cooking enthusiast will appreciate. Child friendly plastic plates and cups provided. Blu-ray disc players in the living room and in the 2 king size bedrooms. Wii and Xbox with games provided. We like to keep on-hand snorkel gear, boogie boards, beach chairs, coolers, and beach toys for the kids. Surf and Stand Up Paddle (SUP) rentals/lessons a few blocks away at Kalama Park. Public tennis courts within a 5 minute walk of the house. Racquets and balls provided. Enjoy the beautiful courses at Wailea and Makena. Thank you for letting us stay in your beautiful home. I absolutely loved staying here. Great house, and very beautiful. Worked very well with our family. Jenni is amazing and there when you need her. I would stay again and would recommend to everyone. Hands down the best equipped VRBO I've stayed in. Very easy to feel right at home, and almost anything you would need is available in the house, including high chairs, if traveling with small children. Quick walk to many shops and restaurants, and a good central location for getting to most parts of the island. The house was clean and beautiful, and we really enjoyed having coffee on the back patio every morning. If I make it back to Maui, this would be my first choice in places to stay. We are so happy you enjoyed the house. We also love sitting on the patio having our morning coffee or evening glass of wine. It is so peaceful there. Mahalo! Jenni and Dave’s house was just perfect for our 3-generation family of 7. It was in a great location close to the beaches and activities in Kihei, and also centrally located as a “home base” to enjoy all Maui offers. Our youngest kids loved playing at Charlie Young beach (a giant sea turtle came up and rested on the beach our arrival evening; what a sight!) and at the playground at Kalama Park, while the teenagers had an absolute blast taking surf lessons at the cove. The grownups were grateful to come home from all the activities to a place where we could spread out. We made full use of the kitchen and grill, enjoying appetizers and a glass of wine in the evening on the outdoor furniture. Jenni and Dave thought of everything and we wanted for nothing. Thank you for helping make this a great trip! Amazing place for our family! Thank you Jenni and Dave for providing us with a wonderful place to vacation with our grown children and grandchildren. We very much appreciated the provided beach and snorkel gear as well as toys for the kids. Besides grabbing groceries we had everything we needed. We would highly recommend your home and would definitely stay again in the future. This home easily accommodated our family of 6 adults and 3 children( ages 4 years and 18 month twins). Everything you could possibly need for your stay is at the house and there's an outside area for kids to safely play(also an abundance of toys for them to play with). We truly enjoyed our stay at this home and would recommend to anyone wanting a fully equipped, clean home to enjoy while staying in Kihei! Thanks for making our holiday great! Kihei Garden Oasis is located in the heart of sunny Kihei, near the breathtakingly beautiful and famous white sand beaches (Kamaole I, II, and III). Just a short walk to all the amenities including Kalama Beach Park, tennis courts, inline skate park, playground, and to the many restaurants, bars, shops, and open air markets and farmer markets in the area. A 10-minute walk to the Cove Beach Park, a great place to surf, stand up paddle board, or sea kayak. Just past the Cove, is Kamaole beaches. Near some best snorkeling on the island. Golf at the many nearby golf courses. For USA, if the option is available, eCheck is our preferred payment method due to high credit card fees.